Commute to work on the bicycle. Average heart rate 132 bpm so definitely a regeneration workout. Although, at one point, at the beginning of what Strava calls the “Olomoucká I” segment, a 500m long climb of 27 meters elevation difference (5% average grade, 10% max grade), another cyclist was just behind me, and I had to push a bit harder to avoid him taking over. That pushed my heart rate up to 176 bpm. The post summer vacation / pre winter season lactate step test on the Concept2 erg. I did 6 intervals of 10 minutes at increasing power, taking a finger prick lactate measure after every step. I started at 170 W and increased with 10W after each interval. After reaching 4.6 mmol/L at 210W and feeling like you feel at 4.6 mmol/L, I didn’t continue to 220W but took the last interval as a cooling down. The goal is to determine the threshold, under which lactate is flat. For me, this seems to be just under 200W, but I will confirm this next week by rowing 6x10min at a constant power of 195W, taking a lactate measurement every 10 minutes. The “Model” line is a line that I “fitted” through last year’s data. For comparison, here is the graph that I compiled in November 2015. So in comparison with November 2015, my steady state lactate level is higher, the step is more pronounced and seems to be shifted to the left. I guess that corresponds to being in a worse shape, fitness wise. Vacation effect, I think. We’ll see if this is confirmed next week, but it looks like my steady state should not go above 195W. Did that in 265W, 3:39.3. 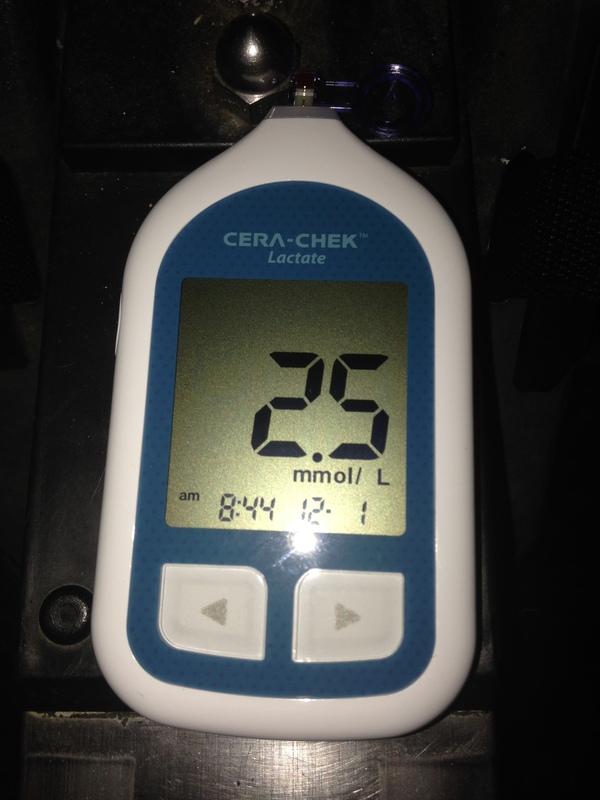 Lactate was 5.0 mmol/L after one minute, 4.6 mmol/L after 3 minutes. Twelve minutes of gentle rowing at 2:12 pace. Then the “hard” 1k. Hard it was. Max heart rate 184, average heart rate 178. My original plan was to hold 1:41 pace. I had difficulties from 600m to go and I even saw a 1:49 at one point. 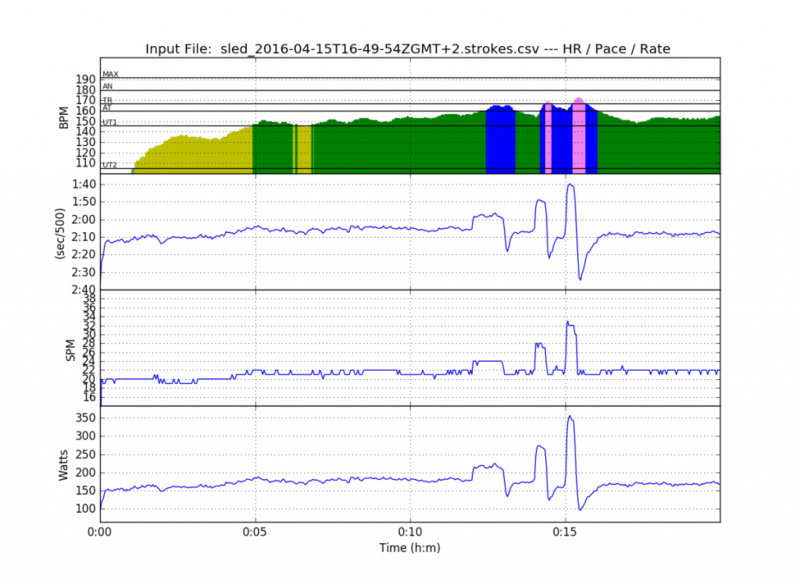 Lactate reading was 8.4 mmol/L, one minute after the row, and 8.6 mmol/L three minutes after the row. The top blue line are today’s results. No wonder I was struggling during the second 1k. I have never seen so high lactates. 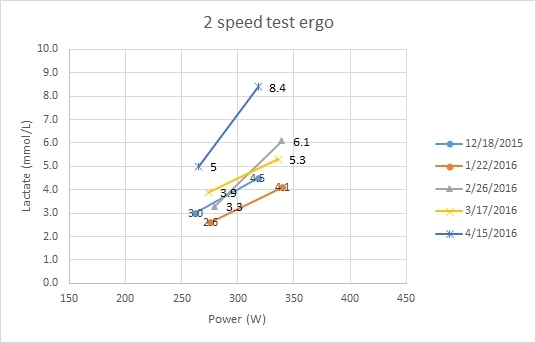 The light blue line is an extension of the >200 W points. For the 318W that I pulled today, that line is at 10 mmol/L. 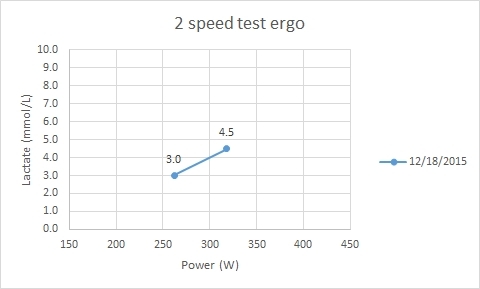 Next week, I plan to do a 1k OTE erg to get a good score in for the nonathlon, before the erg season ends. I guess I will approach this 1k attempt with fear, after this result. After that 1k, I may have to think hard about the effectiveness of the training that I am doing. Wednesday: Nothing. Worked from 7am to 11pm. After 4 weeks, I did the 4 speed test again. Same day of the week. Same time of the day. The only difference being that we are in the “short final” of a very big pursuit. There was a problem with one of the partners, and I was expecting a phone call, roughly at the same time as the test. I sent my partner a message that I might be “driving” and unable to take his call, but would call back immediately. Then it was time for the main event, two 1ks with 15 minutes of paddling between. 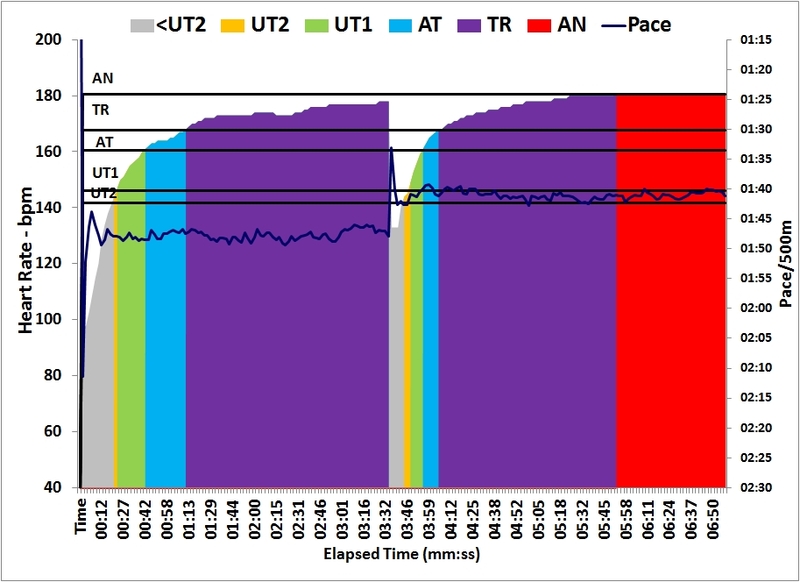 The first one at “6k pace” and the second one “2k pace or faster, preferrably max out”. After the first 1k, I forgot steps 3 and 4. I measured 6.9 mmol/L lactate. I presume my blood drop was contaminated with sweat. I did the measurement 3 minutes into the break and measured 3.3 mmol/L, so I guess my real lactate was somewhere around that value, or perhaps slightly higher. 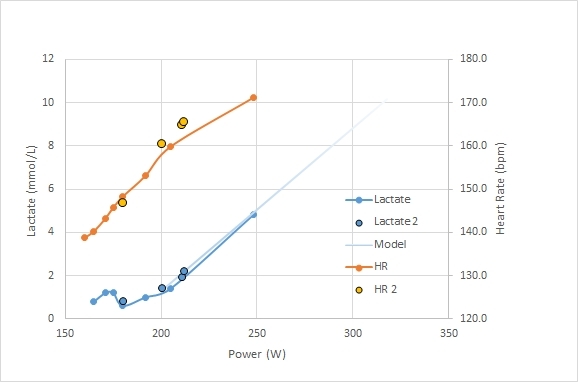 Lactate values above the threshold are not supposed to drop immediately after stopping the exercise, as the blood takes up the lactate from the muscles. Not sure what to think of it. It’s really a pity I missed the first measurement. 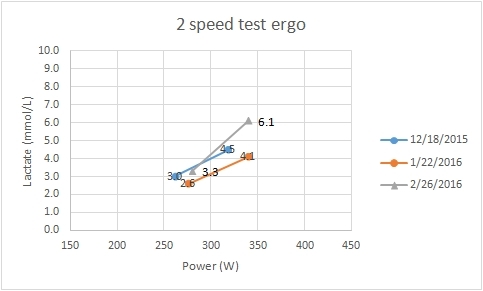 In the graph, I put the 3.3 measured after 3 minutes. I think it is quite close to the truth. Today was going to be the day. To reduce the pressure, I told myself that I was going to row a good half marathon (as opposed to setting a personal best). I would be happy with a well-executed row. 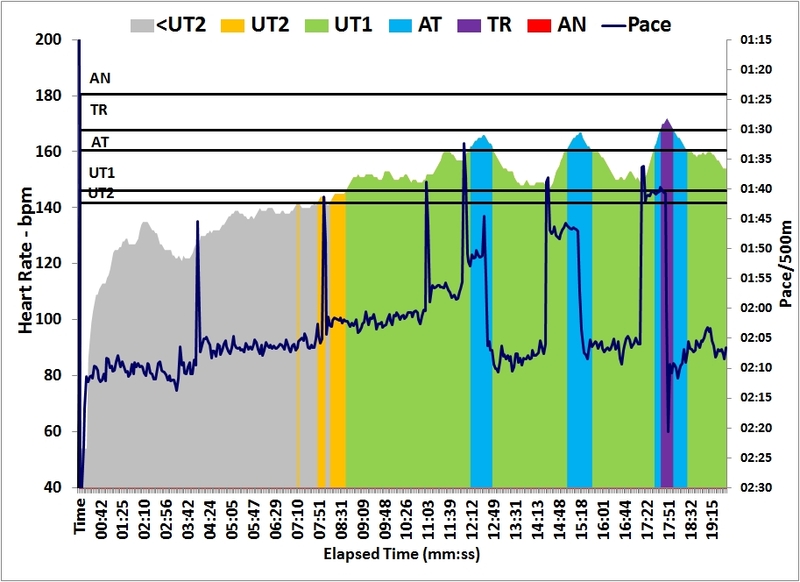 I also decided to hold 1:59 until 6.5km to go, then accelerate slightly. To increase the pressure, I wore club clothes. The long-legged uni, the club shirt with long sleeves, the club turtle-shell vest during the warming up. Romana and Lenka were at the rowing club for their training. The boys were in the living room exploring the new family notebook computer. 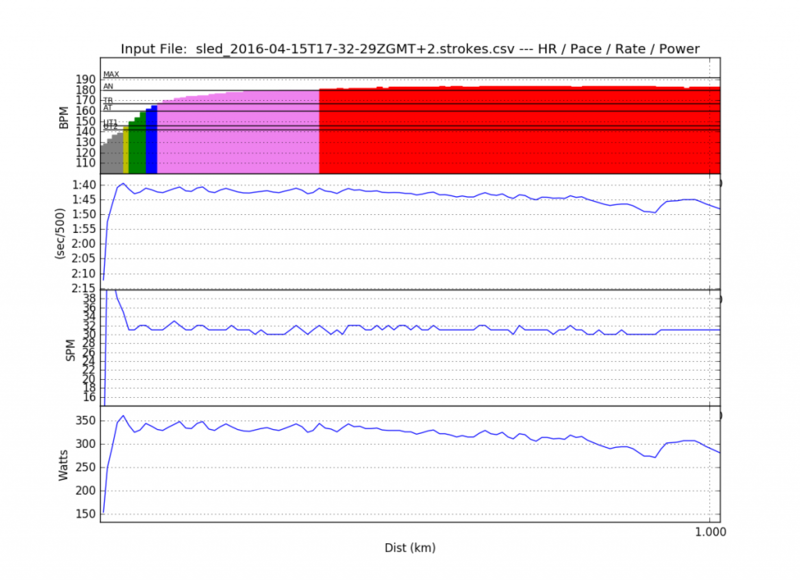 I set up a few smart pace boats in RowPro, as well as my failed row of a few weeks back. Not sure what happened with the smart pace boats though. They were supposed to reflect my pacing strategy, but one of them held 1:49 for the entire row, and the other did the same at 1:55. Not sure that’s what I programmed. 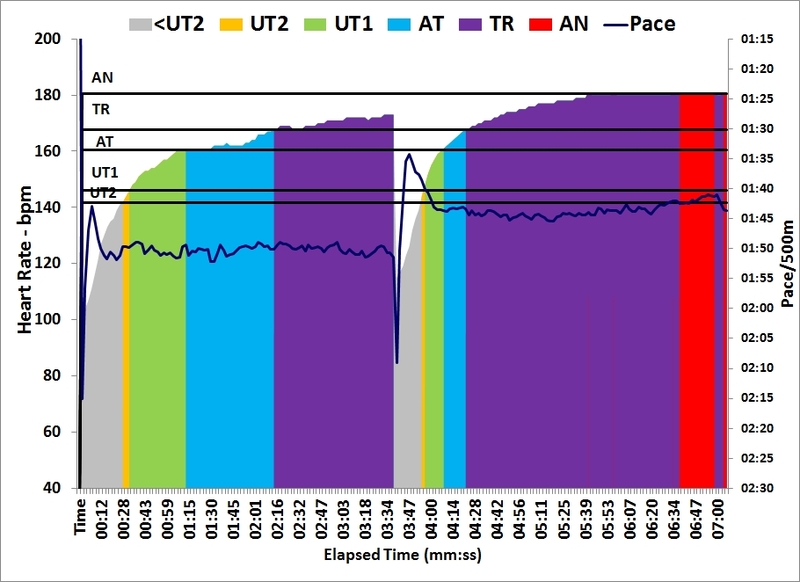 My failed row passed me after a few kilometers but I happily kept rowing 1:59, looking at an average pace on the PM3 of 1:58.9. There would be the incidental 2:00 stroke, and the incidental 1:58 stroke. I counted down the kilometers. About 30 minutes into the race, my son Robin was shouting something to me from the top of the stairs to the erg basement. I shouted back that I couldn’t hear him over the erg noise and the radio and asked him to come down to talk to me. He disappeared for a few minutes, then came back wearing warm shoes and a sweater. He needed the password for his account on the new laptop. I used a random generator to create their passwords so there was no way I would remember it. I told him to play on his brother’s account and read email after I completed my row. I think this is the little heart rate bump around 34 minutes. Last time I was in trouble with 9km to go. This time I was rowing 100m behind my virtual self and within the course of 500m that distance dropped to 50m. I allowed the 1:58 strokes to come more frequently. Then, with 7km to go I passed him. 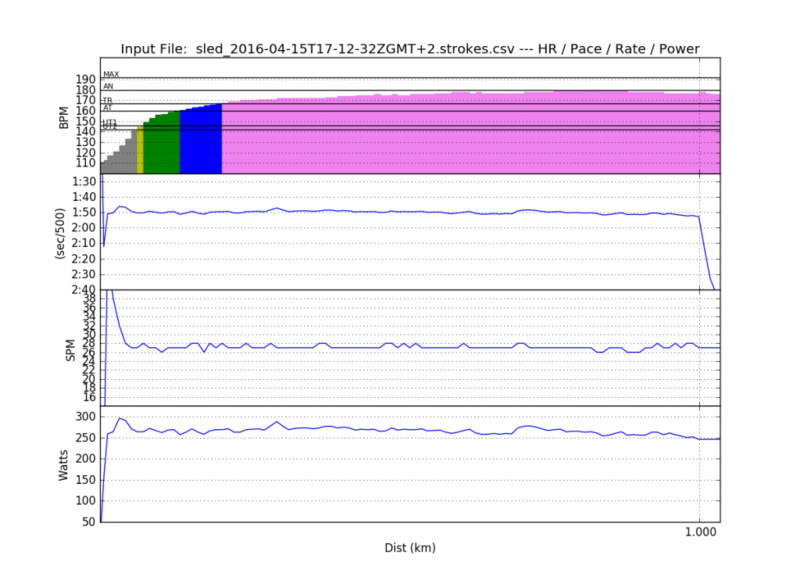 That gave me the energy to start accelerating a bit and I started to row 1:58 strokes, with frequent excursions to 1:57. With 6.5km to go I started to play a game of 1500s. 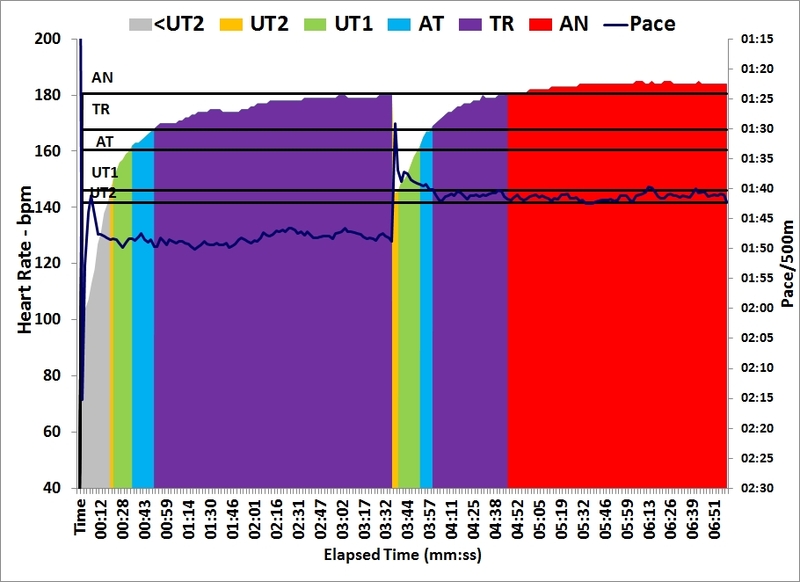 I would row from 6500 to 5000 and check how far I was behind PB pacing plan. Then from 5000m down to 3500m, and form 3500m to 2km to go. 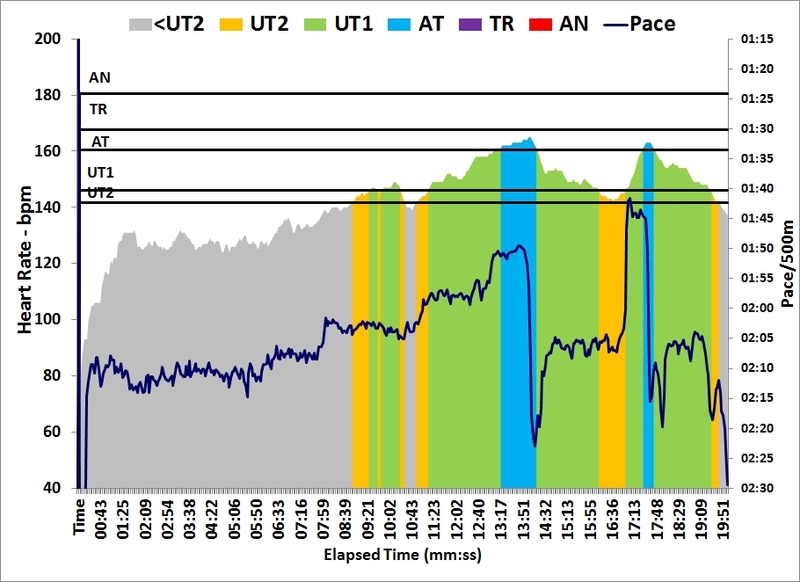 The plan was to accelerate slowly, then do a crazy final 2k, but I decided to push the pace a bit more than the plan and soon the predicted end time was below 1h23. That gave me courage to push harder and get the predicted end time below my PB. After 2km to go the grunting started and the pace became a bit more erratic, but I knew I could row a personal best by sticking to 1:57 pace. I took up the pace a bit in the final 500m and finished in 1h22:38.7. 912 nonathlon points so mission accomplished for this erg winter. Today I ignored lesson 1 for steady state sessions. 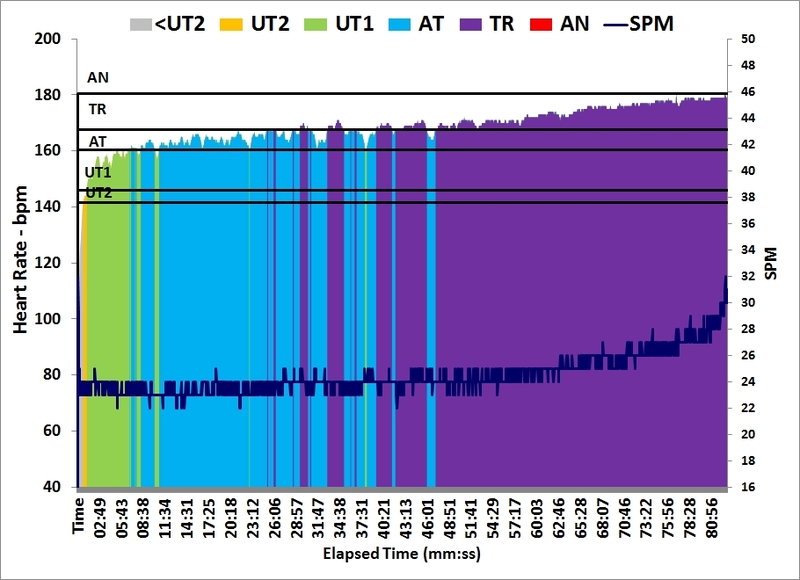 If it is supposed to be a UT2 or UT1 session, it is not supposed to feel like hard work. If it does, you should back down, reduce the intensity, or even just stop and take a rest day. For science (or rather for my curiosity as my method lacks scientific rigor), I pushed on. I didn’t sleep well. I woke up from a dream which I could remember quite vividly, which doesn’t happen very often. It was 3AM. Between 3AM and 6AM I was turning in bed, not sleeping well. I cycled to work. Made a point of cycling very lightly, “to get yesterday’s heavy session out of my system”. I had a big cold salad for lunch, then nothing for the entire afternoon, and for dinner I decided to add an omelet to my usual light dinner. The weather has changed from nice, cold and dry to 10 degrees C, rainy and humid. It is not November any more. 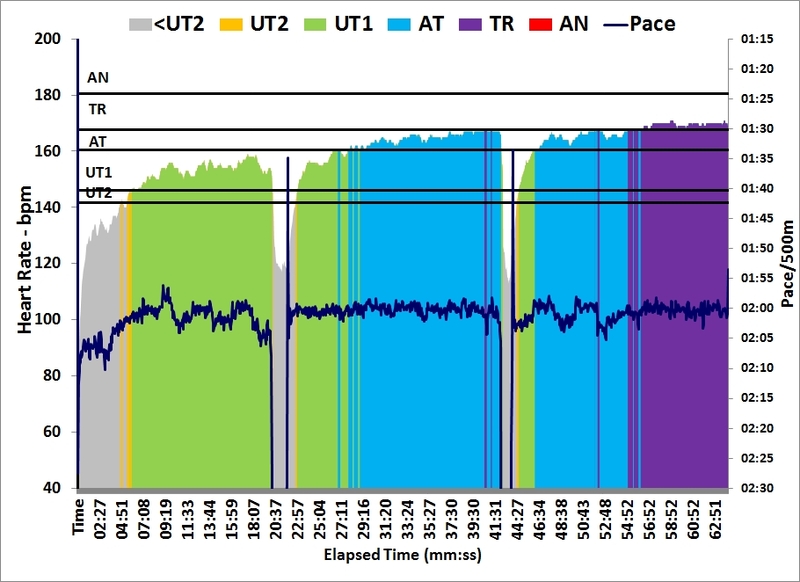 I did a 3×20 min tonight with a lactate measurement after the last 20 minute interval. I warmed up for 5 minutes. First interval didn’t feel too bad. I slowly ramped up the power for the first 10 minutes and ended up doing a 190W on average. 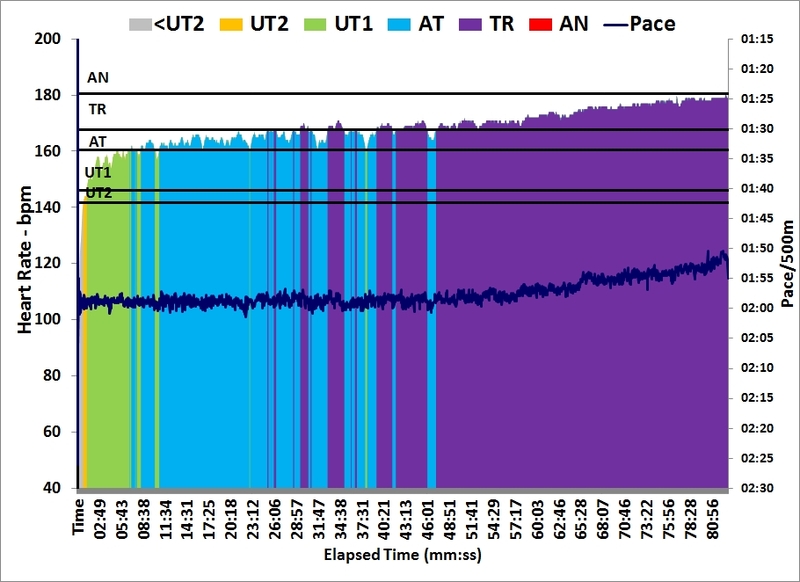 I rowed the second interval with an eye on the clock. It seemed endless. 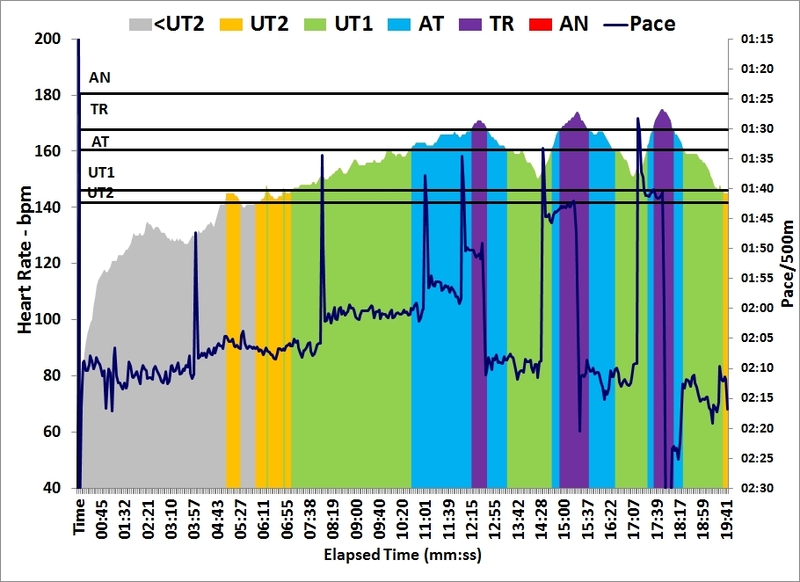 I knew I was working harder than I want to work in steady state sessions, but after 10 minutes funnily the pace started to drift to 210W and I had to consciously keep it down. Still, my breathing and the feeling in my legs told me I was working too hard. Feeling confirmed. I was actually very happy about this result. 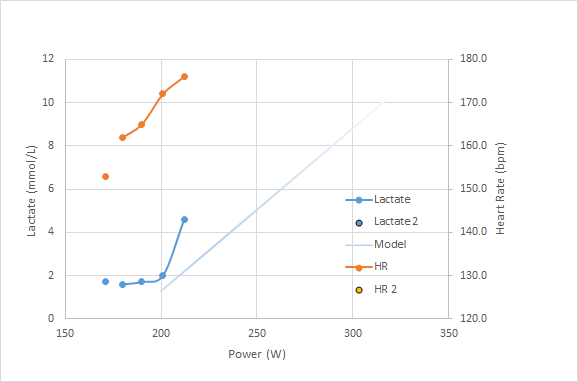 It gives me more confidence in lactate measurement as a method to confirm what the perceived rate of effort tells me. And thus it also gives me confidence to continue doing what I have done so far: If it feels too hard, back down. I’ll start keeping my lactate readings, together with notes on heart rate, perceived level of effort and some other parameters in a spreadsheet.